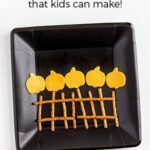 Pumpkins are a great medium for preschool math activities. 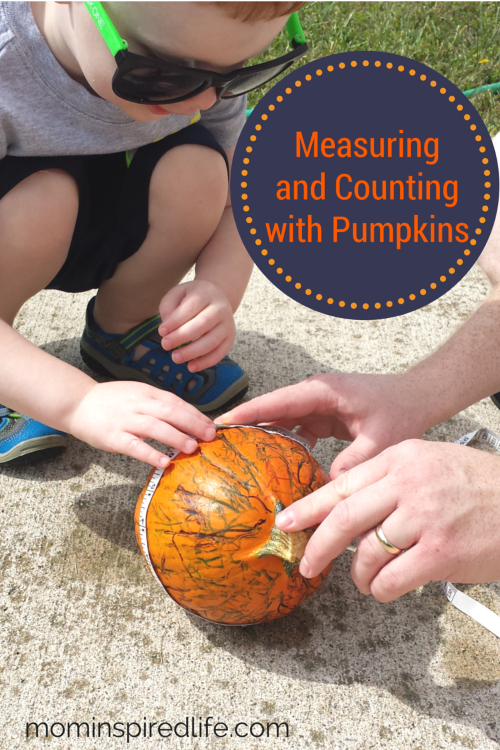 Kids enjoy measuring pumpkins and you can also use them to work on counting and comparing. 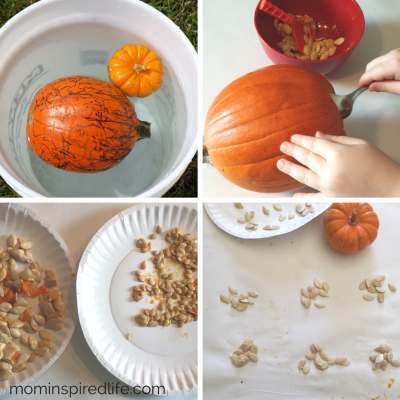 Many preschoolers are very interested in pumpkins so they make the perfect teaching tool. This week the PLAYful Preschool Education team is bringing you many great learning activities centered around the harvest theme. Pumpkins are a big deal in our house. Evan absolutely loves them. So I knew it would be a great idea to incorporate pumpkins during our harvest themed preschool week. 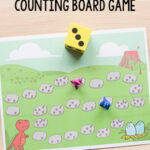 This fun, hands-on lesson will work on several math concepts including measuring, counting and comparing. 1. Lay out newspaper or something else to protect your work surface if you would like to contain the mess more easily. 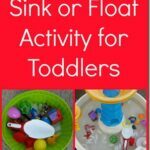 The first thing we did was put the pumpkins in water to see whether they would sink or float and if their size made a difference. Both of our pumpkins floated. I then explained that this is because the pumpkin is hollow inside. Even very large pumpkins will float! The next thing we did was measure the circumference and height of each pumpkin. I made sure to explain how to use the measuring tape and got him involved in holding it and identifying the numbers on it. After that we weighed the pumpkins. We made sure to record all of our measurements for each pumpkin on paper. I did this by dividing a sheet of paper into two columns and recording the measurements of each pumpkin side by side for easy comparison. After all the measurements were taken, we counted all of the lines on the pumpkins. Evan immediately noticed that the smaller pumpkin had fewer lines on it than the bigger one. Now it was time to cut the pumpkins open. I then gave Evan spoons and scrapers to scoop out the pulp and seeds. We kept the seeds for each pumpkin on a separate plate so that we could compare the amount of seeds inside. We also observed the size of the seeds in each. The seeds in the mini pumpkin were much smaller than those in the bigger pumpkin. We were going to count the seeds in each, but there were too many. Instead, we compared the two plates of seeds with our eyes and concluded that the bigger pumpkin had a lot more seeds. Then we used the big pumpkin seeds to count out 10 groups of 10 seeds to make 100 total. Evan was amazed that there were much more than 100 seeds in that pumpkin. That’s a big number when you are three years old! This was so much fun for Evan. 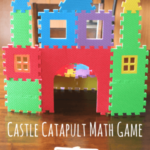 He enjoyed everything about it and I love how many math concepts we were able to work on in the process. We read several books about growing pumpkins before we began this activity. 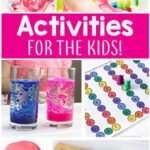 I’ve included affiliate links to a few of our favorites for your convenience. 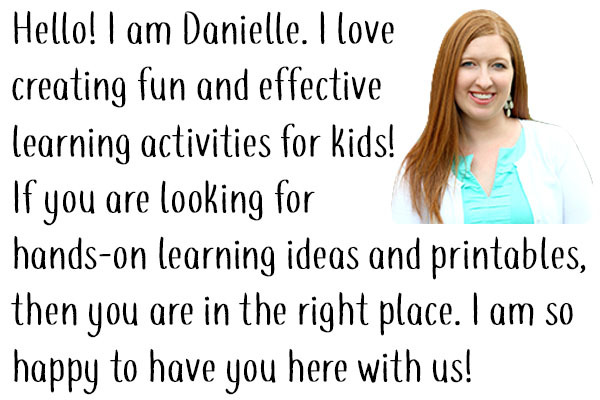 For more fall learning activities, check out my Pinterest board below! 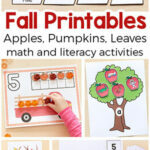 Follow Mom Inspired Life’s board Fall Theme for Preschoolers on Pinterest. Check out the Harvest Theme Google+ Hangout as well!